A supersoft stretch-knit turtleneck, branded with signature embroidery, forms close to the body for a sharp bohemian look. 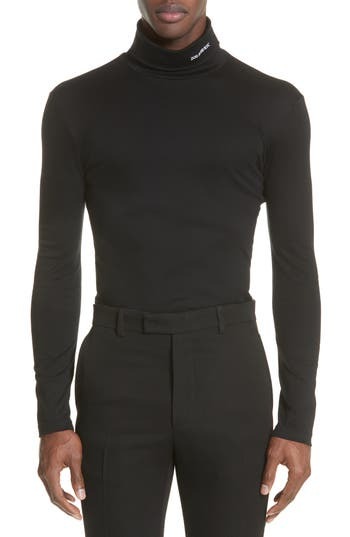 Style Name: Raf Simons Turtleneck Sweater. Style Number: 5672533. Available in stores. A monogrammed turtleneck tops a soft stretch-cotton jersey T-shirt and emphasizes heart-of-the-city sophistication. 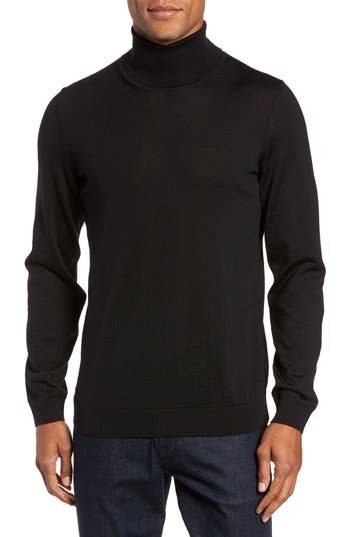 Style Name: Calvin Klein 205W39Nyc Jersey Turtleneck T-Shirt. Style Number: 5624330. Available in stores. A closet staple, this slim pullover is refined in a ribbed wool knit from Italy accented with a distinctive logo patch that can be detached. 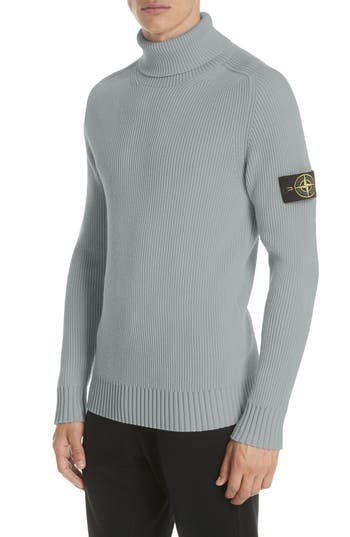 Style Name: Stone Island Ribbed Wool Turtleneck Sweater. Style Number: 5651281. Available in stores. A preppy turtleneck sweater cable knit in soft, warm marled wool and cashmere yarns eases into the cooler season with unparalleled sophistication. 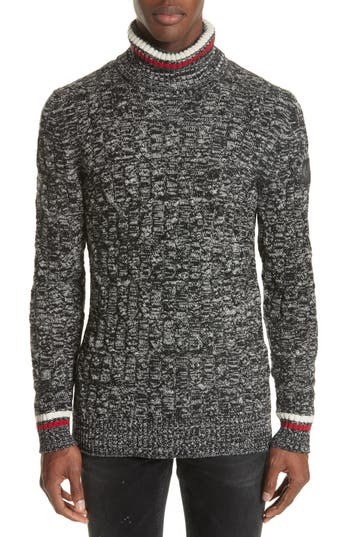 Stripe ribbed neck and cuffs further the dapper style. Style Name: Belstaff Howden Wool Turtleneck Sweater. Style Number: 5682901. Available in stores. 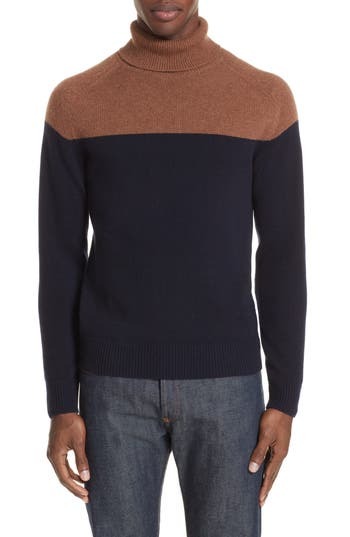 Color-block design defines a charming Italian sweater knit from soft cashmere in a turtleneck silhouette. Style Name: Eleventy Colorblock Cashmere Turtleneck Sweater. Style Number: 5662457. Available in stores. A rich, hearty knit defines a charming Italian turtleneck fashioned from high-quality merino wool yarn. 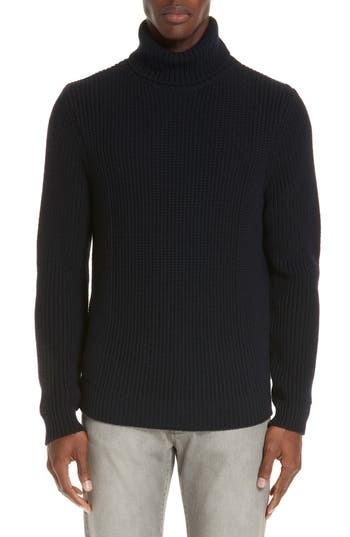 Style Name: Eidos Ribbed Merino Wool Turtleneck Sweater. Style Number: 5648889. Available in stores. Offering full coverage of the neck, this extra-soft, warm virgin wool turtleneck sweater is like pure poetry when it comes to comfort. 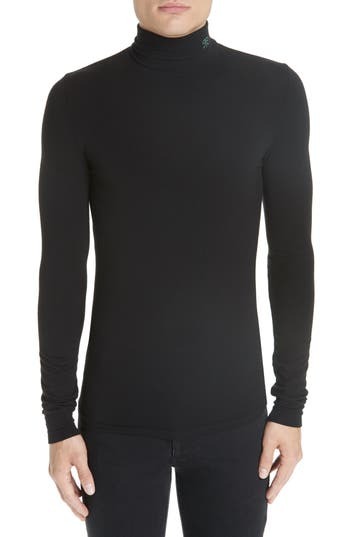 Style Name: Hugo Musso Slim Fit Wool Turtleneck Sweater. Style Number: 5710618. Available in stores.